Russian Air Force will acquire 30 Kamov Ka-226 light helicopters. 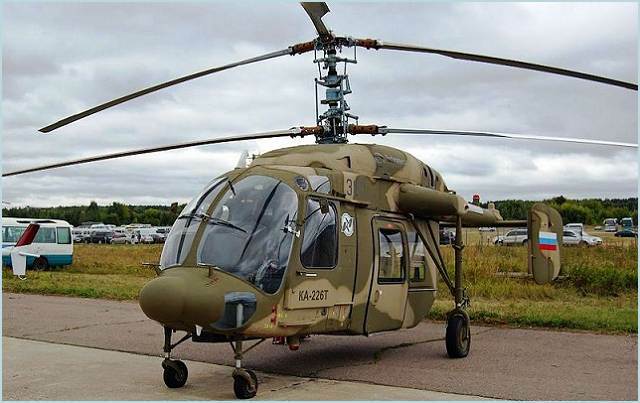 The Russian Air Force is to acquire up to 30 Kamov Ka-226 light helicopters for courier and communications duties by 2020, Defense Ministry spokesman Vladimir Drik said on Monday, January 16, 2012. “By the end of January the (Torzhok) center will get four light Ka-226 helicopters. By 2020 we plan to buy 30 of them,” he said. The Kamov Ka-226 "Sergei" is a small, twin-engined Russian utility helicopter. The Ka-226 features an interchangeable mission pod, rather than a conventional cabin, allowing the use of various accommodation or equipment configurations. The Ka-226 entered service in 2002. The force’s helicopter training center at Torzhok received 17 new machines in December 2011 including the Mi-28N, Mi-35, Mi-8MTV and Ka-52, he said.